Good thing there is the Previous page! I have issues three and four on my wishlist, but this issue starts right off in the thick of it. Let me see if I can recap what happened previously from the page and throughout the issue. There is a Nazi spirit like guy, Schragesturm, and he has this other techno god like being as his captive. 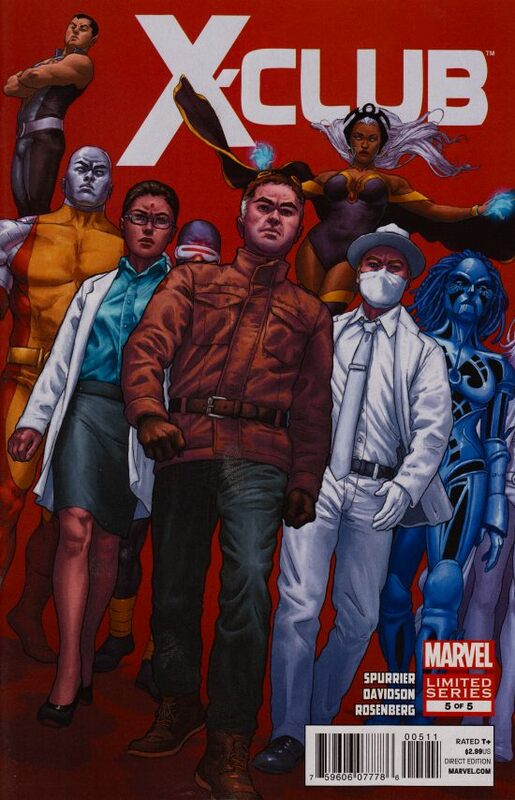 The X-Club members are – Dr. Nemesis, Kavita Rao, Danger and Madison Jeffries. There was a chemical spill that affected the Atlanteans and Rao is trying to cure them. She didn’t have much success with a priestess. Danger is pregnant by the captive god via an energy blast. Jeffries isn’t up to much except that he has romantic feelings for Danger. Also, for some reason, they built an elevator from Utopia to space. “Stringstar” Anchor Base. 0.000. 42.837. Jeffries is carrying Danger, who is in labor. The would-be father is able to speak to them via a pink computer image. Danger faintly tells Jeffries that she needs him. He tells her that he doesn’t got a socket-thingy for her. I’m sure she meant she wanted his support. This isn’t the time for sexual tomfoolery. Meanwhile, the priestess has mutated to a full on sea monster has gone to the base to die fighting Nazis. Rao has retreated to inside the base. Dr. Nemesis is laying on the ground. This is my first introduction to the winner of the Best Breakout Character of 2012 (from the X-Books forums), the Starfish on Doctor Nemesis’ head who reveals all of his secret desires and thoughts. He doesn’t get as much screen time here but he has some great lines, regardless. Doctor Nemesis, the charmer that he is, refers to Doctor Rao (they are all doctors, except for Danger – who I can imagine can become a doctor pretty easily as Jeffries isn’t a doctor either) as “Petri-Girl.” The Starfish reveals that Nemesis finds her to smell nice. Nemesis wants to know if she has any of the Terrigen Mist left. Which I only know that to be an Inhuman item, so that’s nice to see it outside of that title and those characters. Nemesis wants to be injected with the Terrigen serum, so that he can have his mind widen and enter a new realm of being. Thus, he can fight Schragesturm as a quasi-equal. We learn that Schragesturm’s big plan is to rewrite history. Rao is worried as the serum will kill Nemesis. Nothing short of saving the universe, is worthy of a death of a character of Nemesis’ caliber. Or so he says. Nemesis seems to be the star of the series, as he gets some of the best lines – which makes sense as he is the most charismatic of the group. Meanwhile, Jeffries has been cybernetically linked with Danger, so he is within her mindscape. Programscape? I don’t know. He’s in her mind’s eye. Optical interface? He’s there for her, and he’s in the form of a program as well. In a splash page that looks cool, Danger delivers her baby. It looks cool but it is confusing with what is actually happening there. The Between. The Beyond. The Abstraction of Exoversality. Doctor Nemesis is about to confront Schragesturm. Schragesturm isn’t that concern with Nemesis as he has been in this state longer than Nemesis has and thus, more skilled at being close to godlike. Schragesturm reveals that he was the reason why the X-Club originally built the space elevator. Doctor Nemesis belittles Schragesturm with a guess of how lame his master plan is. He’s going to rewrite history so that Hitler won the war and that ol’ story will happen. Schragesturm thinks very little of Hitler (who doesn’t) and wants to rewrite history so that Hitler died rather early on and Schragesturm became the leader of the Nazi party. That is the nice thing about Hitler, you can say all sorts of horrible things – as long as it is about Hitler, no one will bat an eye at it. Doctor Nemesis sees only one problem with that plan. It is hard to lead an army with a man’s fist down your throat and he punches Schragesturm to the face! There is a double page ad for the Honda Civic!?! Honestly, is this a good use of one’s marketing budget? Probably kept comics at $2.99 for a while. Doctor Rao is thinking of what she can do to be productive. She looks out at the waves and an idea comes to her. She leaves and in a fun sequence is gone for a panel and comes back and says, thanks. Great use of a comic page. Over at Danger and Jeffries, the new baby emerges from the pink image of the father. It rips the father in two, releasing him. It reminds me too much of the whole Carol Danvers, stuck in Limbo, and forced to have Marcus’ baby – who was really just Marcus but now he could be born and return to Earth. Not a great story to harken back too. While trying to remember if that guy’s name was Marcus, or not, I found this very interesting website. Figured I would share it. Such a dark moment in that character’s history. It makes sense that Marvel would constantly go back to the whole Rogue stealing her powers and her memories thing and not also keep going back to the Marcus situation as that whole situation is a real mess. Mess, being the nicest word to use. Claremont tries to ratify it a little with Avengers Annual 10 but ooof, the only way to get away from it is to just forget about it. Sorry for the random thought there, but Danger’s whole baby situation seems odd. Maybe if I had read issue four, it may have made sense. So the reason why Danger got impregnated was that the god that Schragesturm has captured, is locked behind a program it can’t figure out so it sent a request to work around it and that got into Danger and she had to release it. They use ‘pregnancy’ to put it in terms we would understand. That’s my understanding of it. Back in the In-Between. I sort of like how we keep just checking in on the team. The team is divided, so our interest is divided. Doctor Nemesis is loving the situation he is, it is a giant achievement in science and I also could not be happier along with him. Schragesturm is going on about how powerful he is and Nemesis just wants all of the exposition to stop. Doctor Nemesis pulls the ol’ ‘look behind you’ trick and of course, Schragesturm doesn’t want to fall for it. Which I like how the new thing with the trick is to actually have someone be behind the person. Behind him, is the entity that impregnated Danger and Schragesturm only knows as ‘the entity.’ To the entity, time has no real meaning but he knows that he was held prisoner for quite some time and now, it is pay back. Schragesturm disappears along with the entity. Doctor Nemesis returns to his earthly body, shouting, win! He wins at all science. He goes on and on about how much better he is than others. He wants a larger tombstone than Darwin. Not being content to just say the words aloud, he looks for an audience. He begins to call Rao “Petri-girl” again when she shushes him. She just saved his life. He’s surprised by this as she (being a microscope monkey – maybe the worst insult of all time?) isn’t suppose to have access it grown-up physics toys. She had the cure for the Terrigen but it wasn’t set to the right frequency, or wave. If Warren Ellis wrote science like this, I may be a bigger fan of his. Before injecting him with the cure, he wants to tell her something. If he had more time, he is sure that he could have grown to tolerate her company. Such a charmer! She shoves the syringe into his neck stating, you romantic devil. They were not this much fun during their time in Uncanny X-Men, so I’m glad they were given this miniseries. I really must seek out issues three and four. 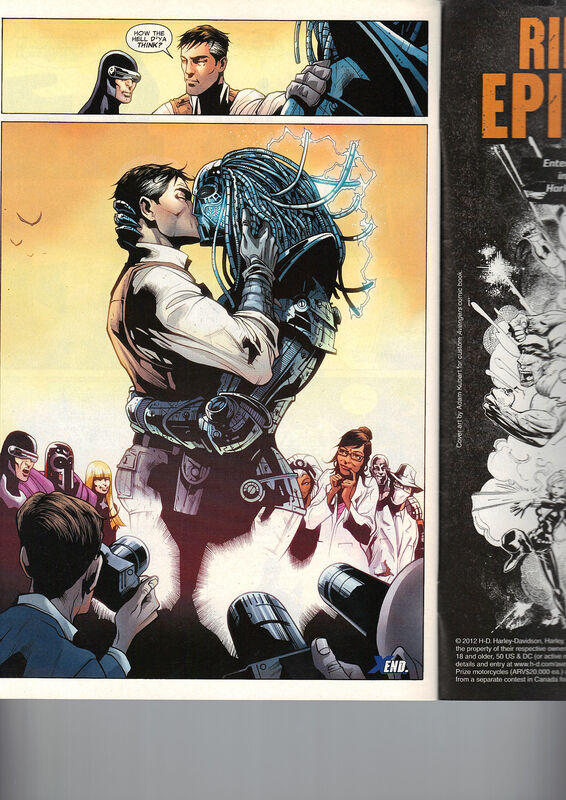 There is an house ad for Rick Remender’s Uncanny X-Force storyline, Final Execution. I own most of them. Four days later. Still at the Anchor Base. Cyclops is trying to give a speech to some gathered reporters. Behind him are the X-Men and the members of the X-Club. Did the reporters really have to be flown to the base? Couldn’t the presentation be done closer to shore? I guess the X-Men couldn’t be on shore so this was the next best thing. Cyclops makes the mistake of stating that he can’t really explain all of the complexities of what happened. This gives Doctor Nemesis the opening he wanted and he pushes Cyclops aside. That an extra-conceptual entity which was held captive by their secretly fascist allies has now returned to its native plane, taking with it all trace of existentially problematic pollution and sealing the dimensional fracture behind it. ‘Just another boring day at the office’. Thanks to UncannyXMen.net for the paragraph assistance! He has more to say but since people are taking the mic, Rao wants to add that she had divine inspiration. Cyclops tries to reclaim the press conference but the word ‘divine’ sets off Nemesis. He and Rao start having a conversation behind Cyclops that can be picked up by the microphone. Clearly, Cyclops did not rehearse what was going to happen today. I wonder why it took four days? Do reporters wait for all of the bodies to be taken from a site before agreeing to go to a location? That doesn’t sound right. We learn that Rao’s cure did work for all of the Atlanteans. She cured all of Neptune’s divine realm. A line that I sort of read and moved on from but now I get her divine comment. The God of Freshwater and the sea, Neptune, inspired her with the waves. Doctor Nemesis tells her that he doesn’t believe in any of that sentimental nonsense. The starfish pipes up next, stating that Nemesis wishes he could believe in that as science can be scary. Rao finds it cute that Nemesis has decided to keep the starfish. He claims it is so he can study it but then the starfish reveals that Nemesis gets loney. Or Roney, as we say at Klein Manor. Cyclops tries to reclaim the press conference again but Danger takes the podium. She has decided to claim the base in the name of all inorganics. The base shall be a sanctuary for artificial life. Sounds like a case for Matt Murdock! Danger states that her child is the Stringstar (which I’m sure the reporters have ceased recording at this point). Cyclops can’t say anything but to mutter that this isn’t what he agreed too. Jeffries goes to Cyclops that they have an Utopia and AI should have one now. Cyclops tries to remidn Jeffries that the entire project was about breaking down communication barriers. Cyclops isn’t sure how they will do that with machines. Which is a silly question in a world with Danger and the Vision. Jeffries, instead of saying all of that, just gives Danger a sweet makeout session. I like how happy Magik is there. Do Jeffries and Danger have a relationship? I know, now, that Warlock is trying to flirt with her in All New X-Factor but I’m not quite sure what happens to X-Club after this. I know Doctor Nemesis leaves to join Cable’s X-Force after Schism. So that’s two of the four members.